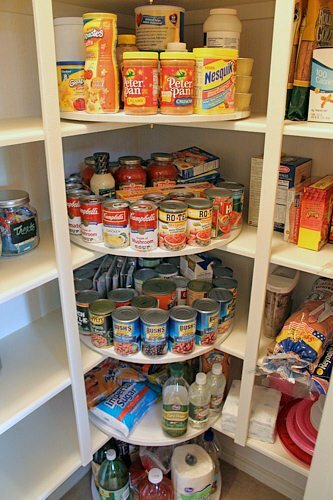 10 Easy Organized Pantry Ideas! Nothing makes me want to cook healthy meals more than having a neat, organized kitchen. With a small kitchen like mine, this is a constant challenge. If you haven’t yet seen our post on 7 steps to and organized fridge, you can start there if you like. But whether you have a walk in pantry, or have to make small cupboards work, we found some awesome and easy organized pantry ideas so that your kitchen is a more functional, more pleasant place to work! Emily at ‘Decor Chick‘ did this pantry makeover with help from her Dad… Her Dad is a little bit brilliant! Those pantry carousels he designed and made, and how amazing are they? Make sure you check out the whole post on how they created the carousels, and the whole organized pantry redo. Emily at ‘11 Gables‘ turned an old laundry closet into a butlers pantry! My favorite simple trick in this pantry? These stackable baskets used as can storage. Inexpensive, and you don’t have to go to a specialty store to find them. 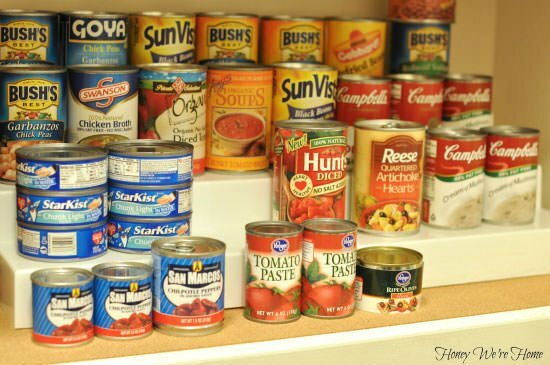 Check out all her organized pantry ideas! 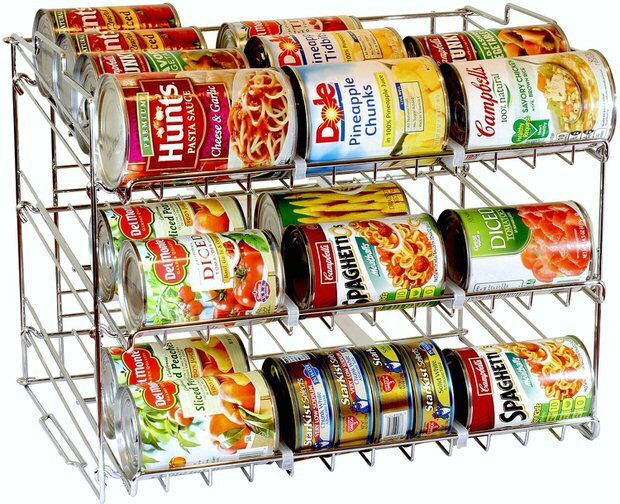 Want a can organizer that is a little more specialized, and dispenses each type of can individually? This one from ‘Amazon‘ would make an easy pantry organization addition to your kitchen. 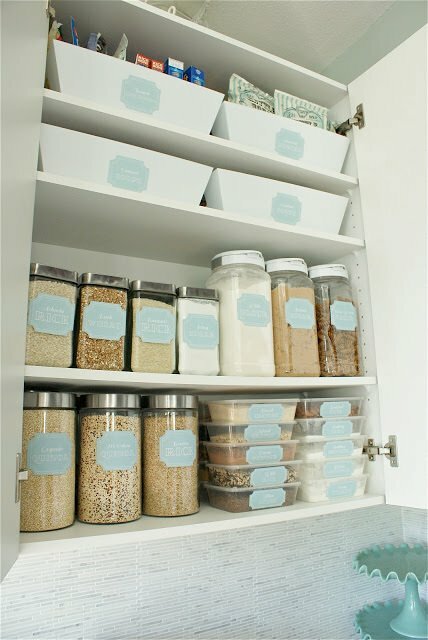 Jen at ‘I Heart Organizing‘ brings us a pantry makeover by Megan from ‘Honey I’m Home‘. 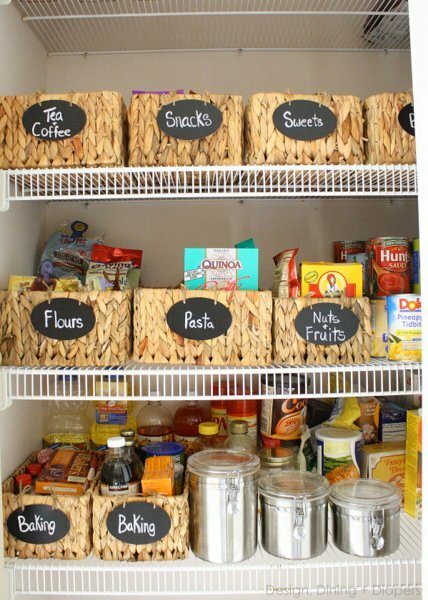 Love all these organized pantry ideas! 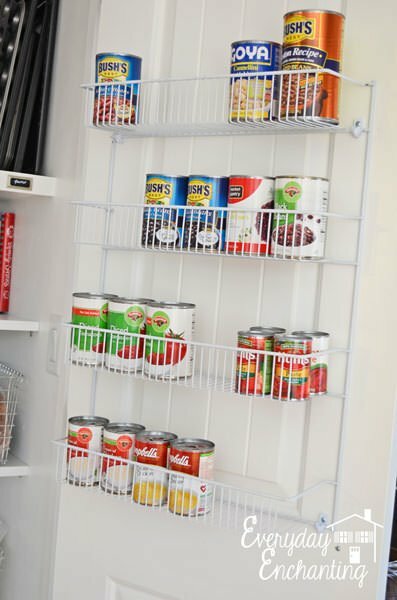 Here is another clever idea for organizing cans… Placing them on 3 tier organizers so you can see all the cans in the back. Ok, this is right up my alley. This dollar store pantry makeover is so pretty! Yep, I said dollar store! ‘The Social Home‘ shows us how to do this, and has a link to their Etsy shop where you can get customized labels. Taryn from ‘Design, Dining and Diapers‘ created a new pantry organization system for herself using these pretty square baskets and labels. These labels are faux chalkboard, but you can buy chalkboard labels at any craft store too. I think it might be nice to be able to change up a basket label easily depending on what I’m buying that week. Love this idea! 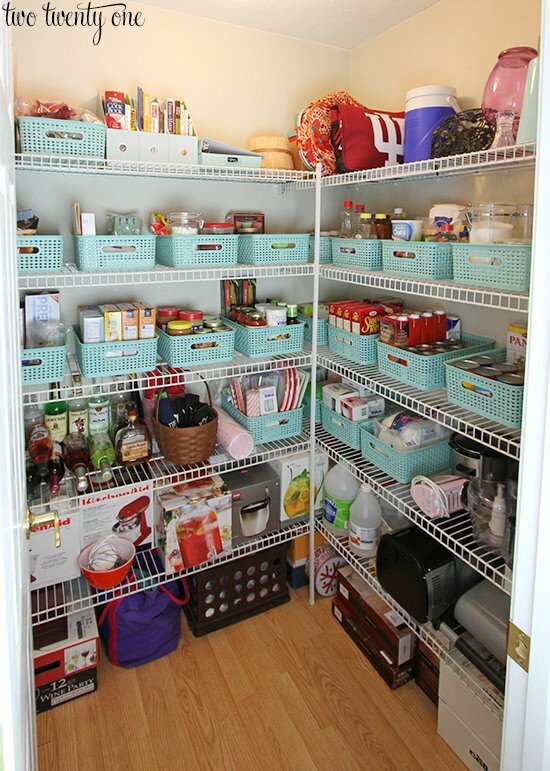 Chelsea from ‘Two Twenty One‘ did her pantry makeover with supplies form an office store. Pretty brilliant, and less expensive than specialty kitchen organizing products. Check out how she did this! The pantry reveal from ‘So Much Better with Age’ has the best tip out there… label everything. 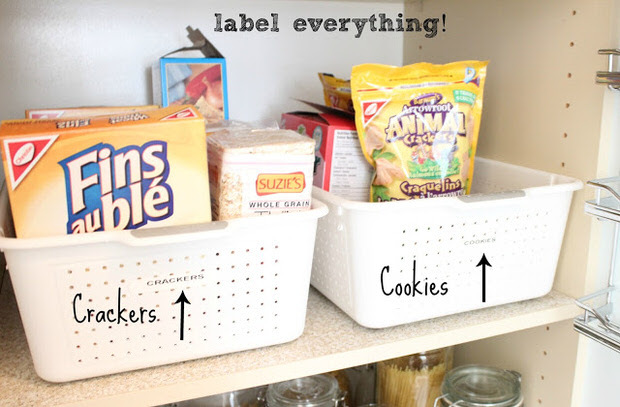 That isn’t their only tip though, they have a bunch of great organized pantry ideas! 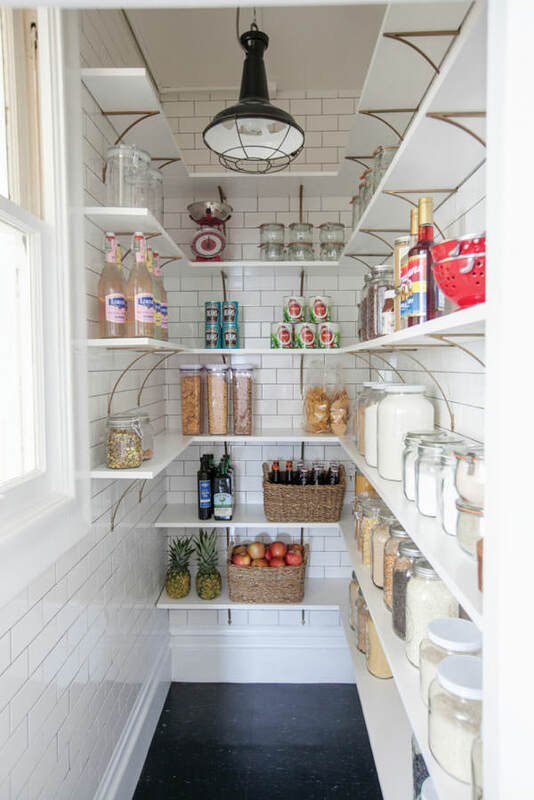 Lastly, I want to share a pantry renovation from Jordan at ‘Oh Happy Day!‘. She and her husband were planning a kitchen remodel, so they drew up a dream pantry to go with it! And this is one of the prettiest organized pantries I’ve seen. Inspires me to run to the store for some glass jars and labels! 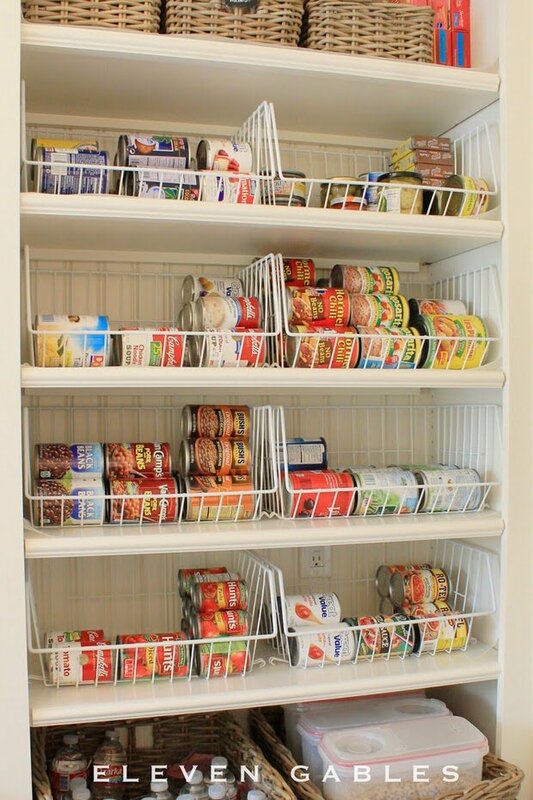 We hope you loved our post on 10 Easy Organized Pantry Ideas! We think you will also love our post on 7 Steps to and Organized Fridge, and DIY Kitchen Islands! I can’t agree with you more, when I feel like cooking I want everything to be organized. I want to be able to put my fingers on every spice that I want instantly. In my kitchen I have all my spices alphabetized. I also want my kitchen very clean when I start cooking. It really helps when you are organized to begin with. This makes cooking fun!! !